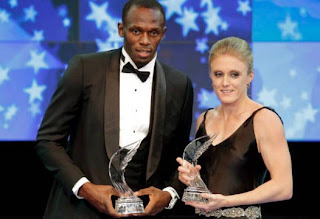 The Jamaican star sprinter Usain Bolt was presented the Athlete of the Year Award. This is for the third time that Bolt received this award. Sally Pearson of Australia, the world 100m hurdles champion, won the women's award. Both athletes got checks for $100,000! Bolt was previously honored in 2008 and 2009 by the International Association of Athletics Federations (IAAF), the governing body of athletics. He was under the clutches of an injury in 2010 but returned to form in 2011 and defended his 200m world championship. He also anchored the Jamaican relay team to win the 4x100m relay in a world record time of 37.04 seconds.Bolt was disqualified for a false start in the 100m final won by his compatriot Yohan Blake, but managed to win his other five 100m races. He also scored the best time of 9.76 seconds. The 25-year-old Pearson won gold in South Korea and set a timing of 12.28 seconds, the fastest for 19 years. This is also the fourth best time in history. Other award winners included Blake for best male performance of the year with his 19.26 seconds run in the 200m at the Diamond League final in Brussels. Vivian Cheruiyot of Kenya won the women's prize for her 5,000/10,000m double gold haul in Daegu.